Chevrolet’s favorite little hatchback has much deeper roots than many people realize. The Spark has been around in one form or another since 1998, and first came to market under the Daewoo Matiz name. When General Motors took over the Daewoo brand in 2002, it continued to sell the compact hatchback under the same model name, but as a Chevrolet. Fast forward a few generations and more than a decade, and Chevy dealers in Albany NY (as well as those across the nation) have the latest version of the Spark on showroom floors. While the Spark may be small in size, it overcompensates in all of the areas that truly matter. The 2016 model marks the beginning of a new generation for the hatchback, and the redesigned Spark is catching everyone’s attention in all the right ways. Chevy knew what they were doing when they redesigned the Spark for the 2016 model year, and the end result is nothing short of perfection. The smallest vehicle in the bowtie brand’s lineup, the Spark also has the smallest price tag. The perfect vehicle for commuting to the office or for longer highway excursions, the new Chevy Spark has been updated in all the right places. Explore below and discover for yourself why Chevy’s smallest, most affordable vehicle may be the exact car you have been looking for. As is true with any redesign, the new Spark received various updates, changes, and modifications for 2016. From the overall body of the hatchback, to the different trim level offerings, the new Spark was tweaked throughout. Check out each of the most notable areas that were changed for the latest model year below. Size – While it has not received a change in segment designation and it is still small, the Spark was treated to a few size modifications this year. One of the most noticeable and exciting changes to the new Spark is a longer wheelbase, and an overall shorter height. While the change in both of these areas is less than a couple of inches, the difference is noticeable. Passengers enjoy more headroom, and the lower stance means less aerodynamic drag, and more miles per gallon. New Engine – Even though you won’t notice it when you see the Spark cruising down the highway, the small hatchback did receive quite the overhaul under the hood. A brand new 1.4-liter engine sits where the less-powerful 1.2-liter engine sat on the outgoing model, and is responsible for upping overall horsepower by sixteen percent. What may not seem like a large percentage is actually quite noticeable, mostly thanks to the small size of the Spark. The engine is also a contributing factor to the hatchback’s impressive EPA-estimated 41 miles per gallon, a point well noted by commuters looking to save money years after their initial purchases. Updated Technology – It should come as no surprise that the Spark has been outfitted with the most recent in-vehicle technology for 2016. Android Auto and Apple CarPlay systems make their debut in the Spark, as well as an enhanced Chevy MyLink system. 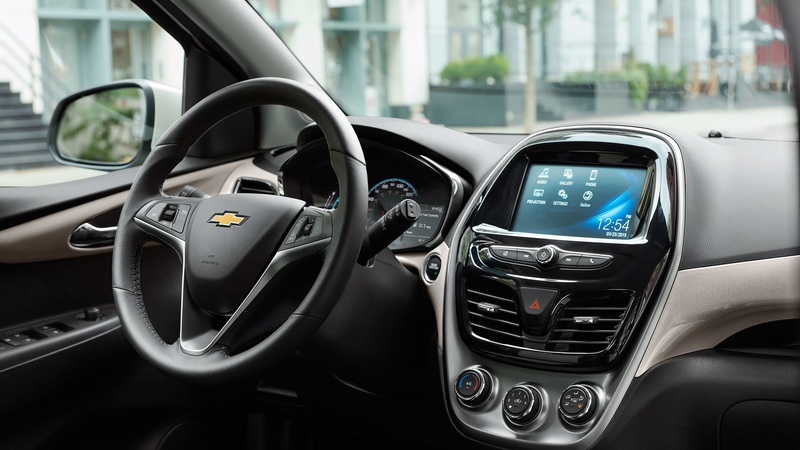 The base model 2016 Spark comes equipped with a seven-inch touchscreen and Bluetooth connectivity, along with Chevy’s built-in Wi-Fi hotspot. Safety Upgrades – The 2016 Spark now offers advanced active safety features like lane-departure warning, forward collision alert, and blind-spot alert. The base Spark now features 10 safety airbags for added security, and now comes with a standard rearview camera. An optional new Driver Confidence Package includes forward collision alert and lane departure warning for the 2LT and CVT models for an upcharge of $3,700. New Standard Features – The 2016 Spark LS is the base model for Chevy’s hatchback, and has a few more tricks up its sleeve with no added costs. Automatic headlights, OnStar with 4G LTE Wi-Fi hotspot, floor mats, a 7-inch touchscreen, USB port, and an auxiliary jack are now standard on the lowest trim level offering. Despite all of the added amenities, upgraded powertrain, and new safety features, the 2016 Spark still offers a low starting MSRP. The base LS model begins at just $12,660 with a manual transmission, while the same trim with an automatic transmission starts at $13,760. The high end Spark 2LT has a starting MSRP of $16,185, and comes very well equipped for the price. The name Spark may ignite a certain fire when you hear it, but it certainly isn’t going to set fire to your wallet. For drivers on a budget who require a reliable, quality-made vehicle, the new Chevy Spark is the answer. The small hatchback is one of the most affordable in its segment, which means drivers can own a brand new car, for much less than even used subcompacts from other brands. Be sure not to let the name of Chevy’s hatchback fool you. The only thing that the 2016 Spark is setting fire to is your outdated expectations of the subcompact segment. The only true way to experience just how transformative the newest model year of the Chevy Spark is, is to get behind the wheel and take it for a test drive. Nothing we can say will convince you, so be sure to take one for a spin and experience it for yourself. We can sit here and try to assure you of this fact all day, but the best way is putting rubber to the road, to see for yourself that the newest version of the Chevy Spark does not disappoint.